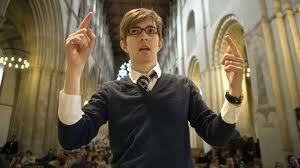 Gareth Malone is the British chorus world's answer to Jamie Oliver. What Jamie has done to revolutionize people's appetite for home cooking, Gareth has done to bring them together in song. I have been following Malone's trajectory with curiosity for the last few years since first hearing about the unlikely idea of a choirmaster as TV personality. But I didn't fully appreciate the power of Malone's TV series The Choir until tonight, when my mum turned on the television, saw what was on and said, "you should watch this, it's Gareth Malone." Over the course of a couple of hours, I sat riveted as the thirty-something choirmaster, who cuts a nerdy-chic figure in Buddy Holly glasses, preppy blazers, knitted pullovers and trendy jeans, took a bunch of stoical army wives from a couple of British military bases and turned them into vocal superstars. In so doing, he also helped to give these women, who felt pretty isolated and emotionally drained, a potent sense of community and well-being. At the start of the show, the ladies were mumbling their way apologetically through a song on home turf. By the end, they were singing with gusto and flair at the Royal Albert Hall before the Queen. All the while, they were soldiering on, fearing for the safety of their husbands, most of whom were serving long tours on the front-lines in Afghanistan. Added pathos came from the story of one tattooed military wife and mother, who at the start of the show, could barely summon up the courage to sing a note to herself, let alone a solo before a crowd. At the climax of the episode, she was belting out the solo part at the Royal Albert Hall in front of 5,000 audience members and millions of people watching at home. OK, so the show was pretty schmaltzy and the simple musical arrangements of songs like the Whitney Houston hit "I Wanna Dance With Somebody" aren't exactly fascinating fodder for the ears. But if Malone's choral interventions don't make for compelling telly, I don't know what does. Following in Jamie Oliver's footsteps, my mum tells me that Malone is headed to the States to work his magic there. I hope the choirmaster makes it as far as The Bay Area. I can think of several groups of people who would benefit from his touch, from the prisoners of San Quentin, to Silicon Valley engineers, to the kids currently starved of music education at any number of our public schools. P.S. "Wherever You Are," the song that the military wives sang at Albert Hall, went on general release in the UK on the 19th of December and is topping the charts for the holiday season.